← Why I spit in the eye of wedding anniversaries. A true story (with the best bit at the end). Have you heard of the Wars of the Roses? I think you’ll need the gist of this bit of British history if you’re to understand what follows – which is actually, I’ll be honest, more about chips (the British ones, like bigger and better French fries) than fish. Here goes, then. The Wars of the Roses. Pay attention. England. Middle of the fifteenth century. Plantagenets rule OK. Well, not OK, actually. 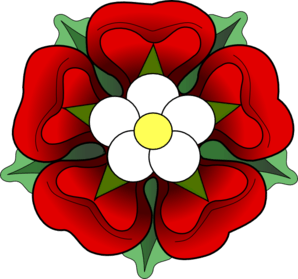 Rival factions, the houses of Lancaster (red rose) and York (white rose) fight for the English crown (let’s not get into why, or it’ll take years, like the Wars). In 1485, Henry Tudor, for Lancaster, ends the Wars by winning the Battle of Bosworth Field, defeating the Yorkists under Richard III – who had been king for all of two turbulent years. The new, seventh King Henry is a bit of a diplomat when it comes to marrying and chooses Elizabeth of York. He then creates a new emblem – the Tudor Rose – combining red and white. So, there we are. King unites Houses of Lancaster and York. Tudors now rule, OK? BUT. If you think it’s only religious wars that drive neighbours to compete – sometimes to a silly extent involving death – you haven’t grown up in Lancashire (red rose county), or Yorkshire (white rose county). These two rival counties sit, like lungs, either side of the backbone of the Pennine hills which straggle up the centre of northern England. Until fairly recently – let’s stab a pin in the 1980s – the north of England was a place of mills and chimneys and industry. Wool and cotton. Coal and steel. Red Accrington brick. Pale Yorkshire stone. Black with soot from tall mill chimneys. And then – it all died. No wool, cotton, steel or coal left to speak of, the chimneys demolished by jobbing steeplejacks. The congested lungs of Lancashire and Yorkshire began to breathe more easily. But the diet that fuelled the workers remained. The first chip shop opened, they say, in Oldham (in old Lancashire) in the 1860s. Notice, chip shop, not fish-and-chip shop. Which I suspect is why, when I were a lass in Lancashire, we called the places that fried fish – and potatoes – chip shops. 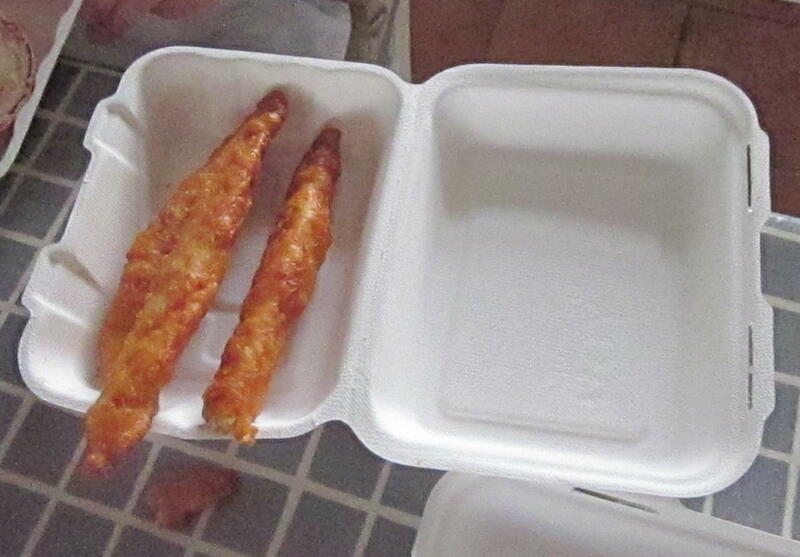 My parents boasted that Lancashire chips were fried in vegetable oil. The heathen lot across the hills not only called ‘chips and fish’ ‘fish and chips’, they fried everything in lard or dripping. Lard – as I’m sure I’ve no need to tell you – is pork fat. Dripping, in case you’re unfamiliar with the term, is the fat that drips off beef when cooking. It turns into a creamy solid layer with a layer of juicy brown jelly on top. People eat it scraped on bread – bread and dripping. But it’s the solid creamy fat that fries the chips. And fish. I suspect most Yorkshire chippies use oil today. But lard or dripping produce a very rich taste. And very greasy fingers. Now, as my American spouse will tell you, England is very changeable. Within just a few miles, you might find a different name for something everyday, uttered in a different accent. Life was a constant source of linguistic confusion for a young lass (a term common to both counties) recently arrived from Lancashire, living in Yorkshire. 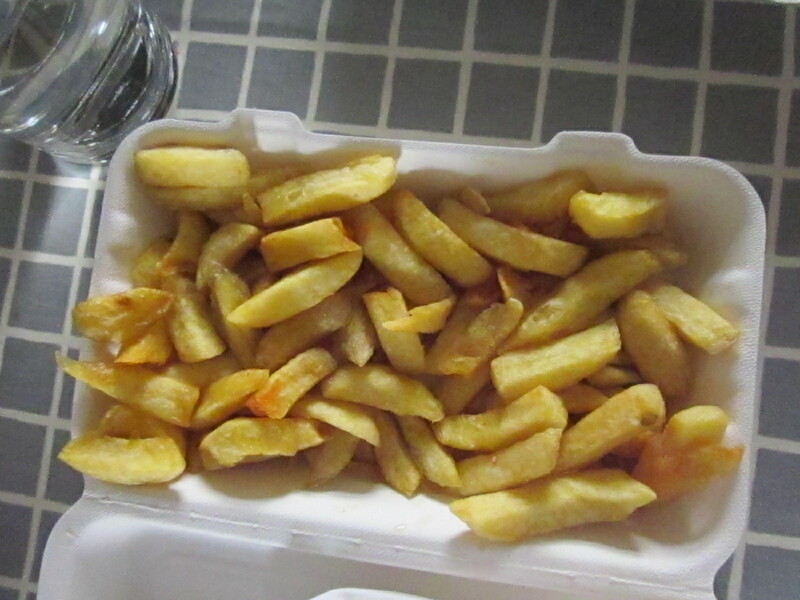 But, happily, whether you call them ‘chips and fish’ or ‘fish and chips’, everyone, everywhere, calls the purveyors of this staple of the British diet a chip shop, or chippy, for short. 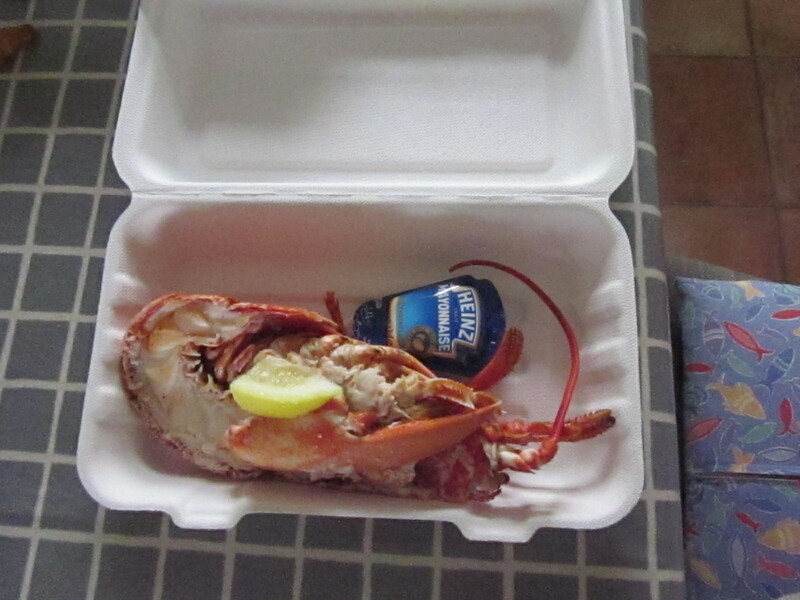 So when Stephen D asked if I wanted to go to the chippy – I knew what he was talking about. He was talking about one of the few ways of going for a walk, beyond sight of home, in the evening, that was allowed to a sixteen year old. OK, maybe 15. But don’t tell. Blonde hair. And a scooter. The Lambretta kind. No, it wasn’t the fifties, thank you, he was a reincarnation of mod – with style. Something about him just – well, y’know. Stephen had strawberry birth marks on his face, but it didn’t make any difference. ‘I’ve seen you making cow-eyes at that young man,’ said Mrs B, next door. So of course, dreamy eyed, I said yes. To the chip shop thing. At the end of our avenue a little path ran across the top of a field that took us to a side street off a main road. To a chippy. We stopped outside the door. And then he kissed me. It all went wrong, of course. I had no idea what to do next. Embarrassed and shy, I gave off the wrong – as in misunderstood – vibes. Years later, when I was home from uni for Christmas, the door bell rang one night. I opened it. There he stood. Still gorgeous. Both of us old enough, now, to go to the pub – where we’d locked eyes across a crowded bar a few days before. I didn’t. It was never meant to be. Now, I’m back in old Lancashire. Twenty five miles from the place I was born. But you know – the best chips – and fish – I’ve ever had – were in Wales. I feel like such a traitor. And me a pink rose, too. This entry was posted in Yorkshire and tagged Battle of Bosworth, chips and fish, first kiss, fish and chips, Henry Tudor, Lancashire, red rose, Richard of York, Wars of the Roses, white rose, Yorkshire. Bookmark the permalink. Lard/dripping wasn’t just a Yorkshire thing. I grew up on Merseyside in the 60’s and 70’s and if you cooked chips in anything other than lard or dripping you were regarded as some sort of alien. Even now I still prefer chips cooked in beef dripping as they taste so much nicer. I believe there are some speciality chippies that still do them that way. My mother also used to cook her roast potatoes in beef dripping and to this day my wife and I still can’t get a roast potato to be as nice as hers. It seems that modern potatoes have been rendered tasteless by the quest for volume yields and even the King Edward that my mother swore by for roasties just don’t taste or cook the same. We also can’t seem to get that perfect combination of rock hard crunchy outer and soft fluffy inner that my mother achieved no matter how many ways we try. Agreed on the Welsh chips but much of that memory may be the stunning scenery and fresh air which makes any food eaten outdoors taste better. I still recount to my children the times when my Sister and I as children would have scampi and chips in a basket (remember those? probably outlawed under H&S as they harbour germs) sat at the head of Bala lake with our feet dangling in the ice cold water and washed down with a coke in a proper coca cola shaped glass bottle. I’m not sure where the borders are now but I was born in the Queen Elizabeth hospital which on my Birth Certificate states Southport which I believe is Lancashire but I’m sure the hospital was part of Liverpool/merseyside which was not? Yes, we par boil until they are soft, then salt and shake them then tip into hot fat and roll them around in that. We’ve tried goose fat too. The Rayburn will get very hot if running on hardwood logs but most of the time we run it on anthracite which is not so good for cooking with. However during the summer we cook on the BBQ and that gets furnace hot when all four burners are running with the lid closed and the potatoes will crisp up fine but they don’t retain the crunch once removed from the oven. My mums remained crunchy even when cooled right down. I’m not sure where we are going wrong. I do wonder if it’s to do with the way a ‘real’ oven (as in old fashioned gas/electric without fan) cooked – dries them out more? loved reading every line of the post..
That may indeed be part of the issue. Mind you I just don’t think the texture of modern potatoes is the same. They certainly don’t have that really earth flavour because it has been bred out of them in the quest to make them less at risk from disease and I suspect the texture is also different. We grow a fair amount of our own veg and my wife has even struggled to get home grown potatoes to have the same flovours that we were used to. However she has started using heritage varieties which are more prone to desease BUT they have much greater flavour and do seem to roast better too. Cold and rainy here as well. Will be in touch soon.